Have you ever found a WordPress site with a design that you love so much you want it for your own site? There are tons of great themes out there to use as inspiration. 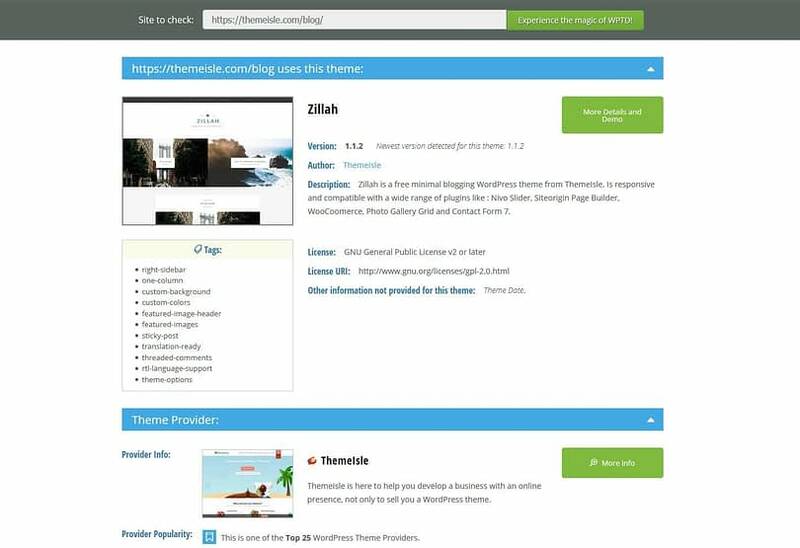 And, thankfully, if you ever find yourself wanting to know which theme a WordPress site is running, one of these WordPress theme detectors can help you out. They’re great if you are a WordPress enthusiast and want to learn new things about your favorite CMS. Or you simply want to prove yourself or somebody else that you’ve guessed the theme right. No matter what your reasons are, the truth is that you can easily find out the secret behind a certain site’s design through awesome WordPress theme detectors, even if you don’t know any code. So, today, we’re presenting you five tools that allow you to look under the hood of a WordPress site and see the themes and plugins that sit underneath. Most of these theme detectors are online tools that you can use right from your browser of choice. Before talking about each tool separately, we made a short comparison that says how many themes were uncovered by the detectors in our list. We tested the five tools on five different sites to see if they worked properly. Now, let’s get to know the candidates from the table better. We’ll talk about each of them in detail and see what they come with. What’s cool is that a lot of these theme detectors go beyond just WordPress themes and provide some other neat information. 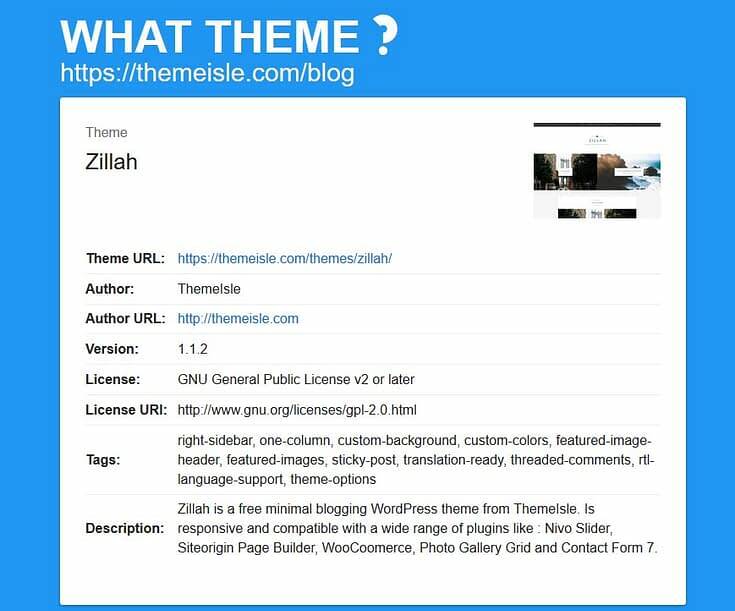 What Theme is a great online tool that not only detects a WordPress site’s theme, but also shows nice details about the theme such as its main URL, the author, what version and license it has, tags related to its purpose, and a description. Apart from WordPress, you can also use it for Joomla, Drupal, Blogger, Shopify, Ghost, Tumblr, Magento, and Big Cartel. What’s interesting about this tool is that it recognizes a custom theme immediately and delivers you the author or agency that built it. You can also use What Theme if you want to find out whether a site uses WordPress or not. 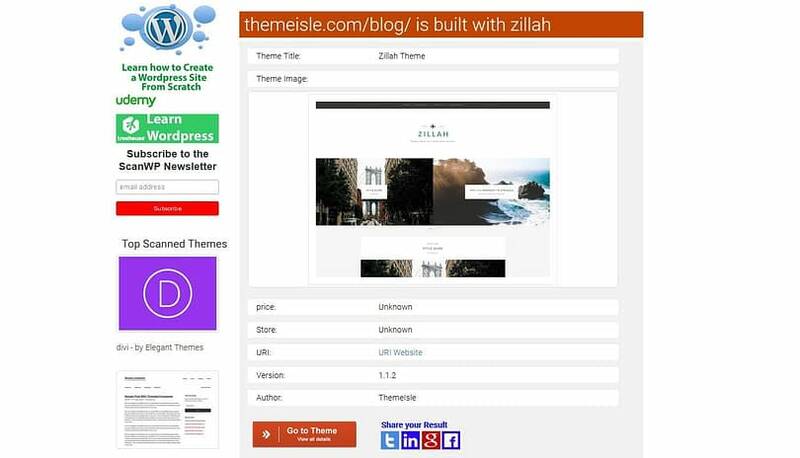 This is a similar online tool made to detect what WordPress theme a certain site is using. Just go to the tool’s page and enter the URL of the site that you want to check in the search bar. What WordPress Theme Is That will not only detect the main theme, but also the parent (if any). It also goes beyond themes and presents you with a list of plugins that are being used by that given site. Unlike WhatTheme, this is just for WordPress, so it won’t detect themes built for other platforms. WPSniffer is a Chrome extension that tells you what theme a WordPress site is using. It doesn’t come with details about the theme or author, it just links to a Google results page where you can find all the pages that lead to the theme. 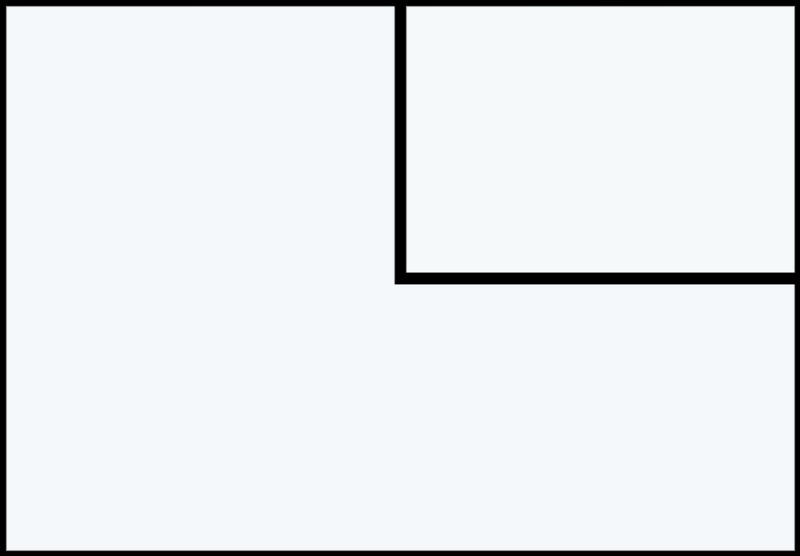 The pages are generated by this exact keyword format “x wordpress theme” (where x is the theme’s name). The tool is easy to use, you just need to click the install button and a gray icon will appear in your browser’s top bar. The icon turns orange automatically every time it detects a WordPress theme. This one is a very cool theme detector not only because it has a friendly interface but also because of the way it presents the detected theme. The tool is online, so you need to just enter the URL of the site you’re interested in. To display the theme it found, WordPress Theme Detector provides nice slide-out sections that deliver helpful details about the author. What is this tool delivering exactly? The theme’s description, tag, license, a great box of statistics about the provider, additional information about the site you searched for, and a list of plugins that the tool was able to detect on the site. 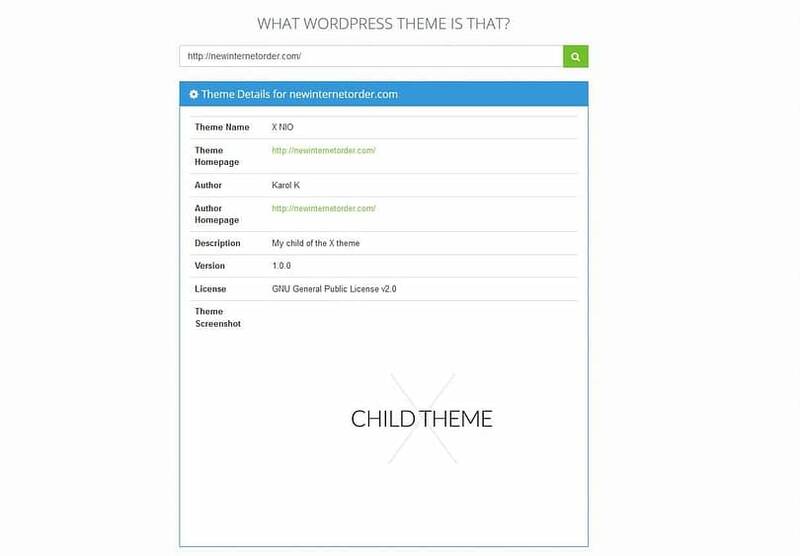 As an added bonus, the tool also detects child themes. ScanWP is another web-based tool built to detect the theme and plugins that a WordPress site is using. It doesn’t provide additional information about the theme, it just tells you its name, URL, author, and sometimes the price. This one is probably the most minimalist of the tools discussed here. It provides only the essential results: a theme’s name, its author, description, version, as well as the direct link to the theme’s official page. 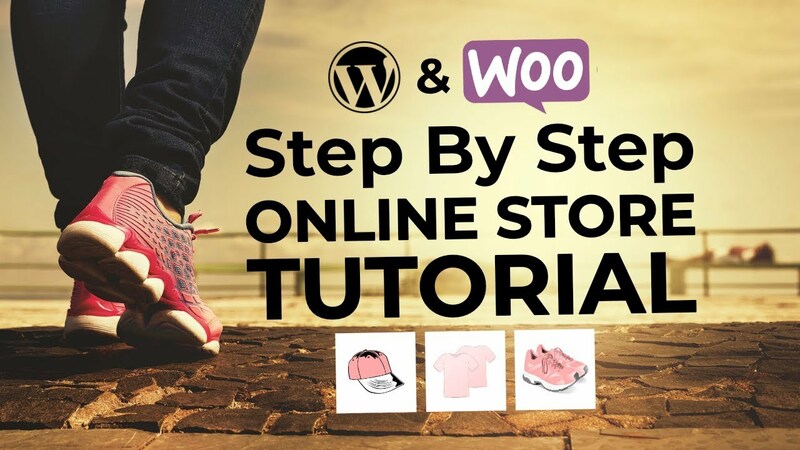 It also tells whether a child theme is being used and returns specific error messages if the scanned website uses a completely custom theme or doesn’t use WordPress at all. The tool works even on websites which are using CSS minification plugins such as BWP Minify that distort the theme’s stylesheets. Putting all the things together, the most effective tool that we found was WordPress Theme Detector. Apart from detecting all the themes, it offers a bunch of useful information about the searched item, including author details and a few plugins that are active on the site. It can also tell the difference between a child theme and the parent. 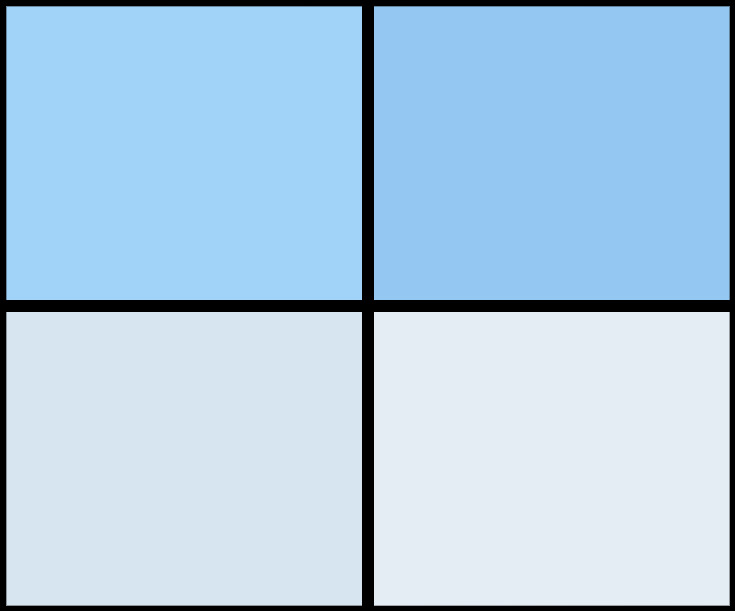 What Theme is a great alternative, returning correct answers for every website, but it can’t figure out if a theme is a child theme or not. Last but not least, ScanWP knows its stuff very well and does offer you a nice list containing the theme and a limited number of plugins a website is using. I called this one the “developer method” because this is how developers investigate websites. For them, doing this is like copy and paste. But it’s not too complicated, so you can probably figure it out even if you’re not a developer. This time you won’t need any tools, you just have to go to a website, right click on the page, and select View Page Source. Or you can simply press CTRL+U. The page’s code will appear in a new tab and all you have to do is search for “wp-content/themes” using CTRL+F. You will find the name of the theme written in every single line that contains this exact phrase. This option is the simplest but it doesn’t work all the time. Every site usually comes with footer credits, mentioning the platform and (sometimes) the theme it’s using. So before you use the methods from above, you should first look at the site’s footer because the answer you need might be there. So this is it! We would love to hear about your favorite method to detect a WordPress theme. 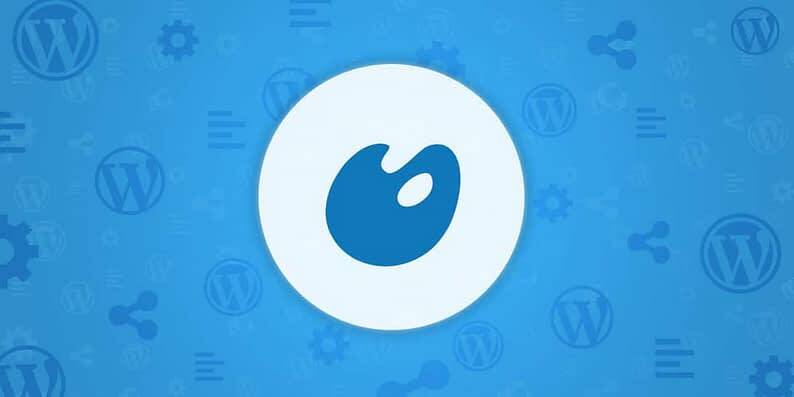 Of course, if you know of other great solutions beyond these WordPress theme detectors, feel free to share them with us in the comments section.